This 14K White Gold engraved match set has a total of 13 channel set diamonds when worn together. The diamonds have the color of G-H and clarity of SI. 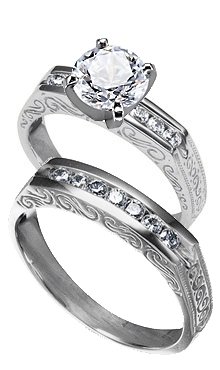 The distinctive squared tops carry traditional scrollwork and are a handsome choice for someone special to showoff her beautiful center setting. You choose the center diamond from Danforth's inventory.